View more presentations from South Valley Jr. High School / Park University. Many people think of George Washington as a general or a president but he was also a very innovative farmer. During my week at Mount Vernon this summer as a participant in the 2010 Gilder Lehrman Summer Seminar I spent time studying Washington's actions as a farmer. He did some amazing things on his farms and was on the cutting edge of technology for his time. Today on a visit to Mount Vernon you can visit a reconstruction of the 16 sided round barn he built and designed to thresh grain. One of Washington's most important decisions as a farmer came in 1765 when he decided to shift the from growing tobacco to wheat. He was one of the first to do this on a large scale in Virginia. He made this decision for several reasons and it ultimately allowed him to make a profit at a time when those who stayed with tobacco eventually fell further in debt. During the seminar I created a lesson plan to help students analyze why Washington made this decision. The lesson is created primarily for a middle school or junior high history class and can be conducted in one 45 minute period. Students will also be using a couple of primary resources from George Washington. The podcast describes the lesson plan and this blog post includes a full description and materials in PDF format. This blog entry also includes a short video shoot at Mount Vernon with Daniel Purkey, Lead Interpreter for Historic Trades at Mount Vernon, describing the reasons for Washington's decision. Hello. Several weeks ago I was very fortunate to participate in the 2010 Gilder Lehrman Summer Seminar for Teachers at Mount Vernon. One great opportunity while attending the seminar was the opportunity to stay on the grounds at Mount Vernon. 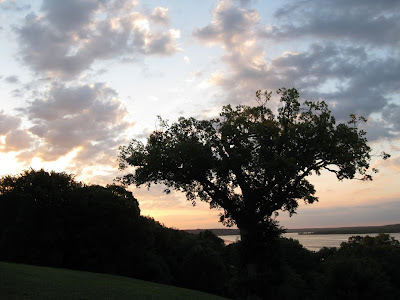 On a couple of the mornings I got up around 5:15 AM and walked to the mansion to see the sunrise over the Potomac River from the back porch. Today's podcast is a very quick reflection on that experience. 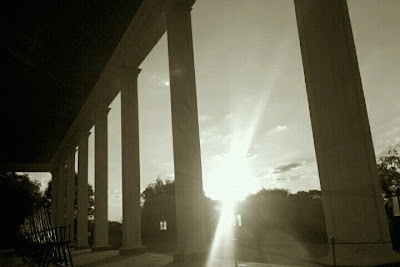 I have also added several of the pictures from that morning at the mansion with this blog post. You can view over 900 of the pictures I took while attending the week long seminar at this Flickr set. Hello. This week I will be attending the 2010 Gilder Lehrman Summer Institute at Mount Vernon. I will be spending the week touring the grounds, listening to presentations about Washington and learning as much as possible about the life of our first president. I will be Tweeting, writing some blog posts and sharing lots of pictures (the one above is the mansion this morning as I took my morning walk). I hope to share this experience through the blog. Today my 8th grade American history classes in Liberty, Missouri participated in a live video chat with Pat Hughes, author of Guerrilla Season. Guerrilla Season is a book with a focus on Clay County (the county in which we live) in the years just before the Civil War. 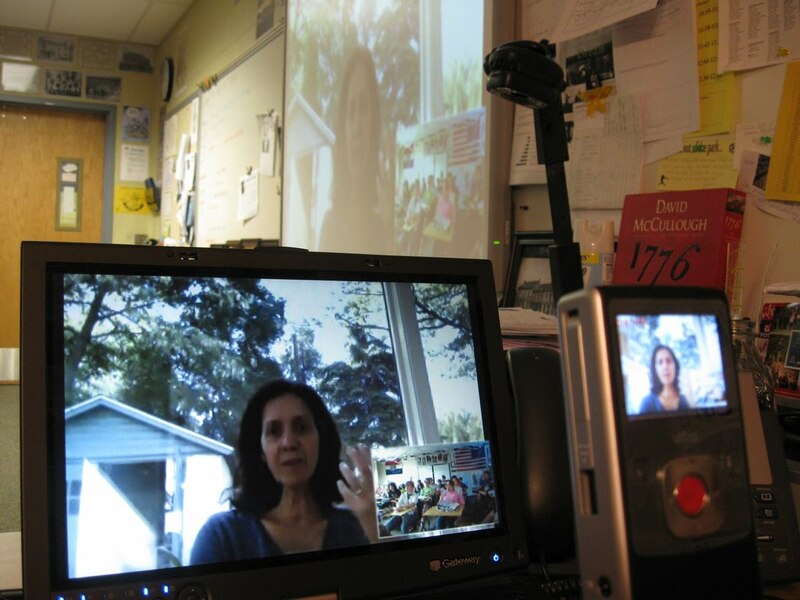 We used G-mail video chat - free - to visit with Pat from her home in Philadelphia. I also used a Flip cam to record the conversation for students who missed it and wanted to watch it. Pat spoke with us from her sun room and then took us upstairs to show us her office and shared some of the resources she uses to write books about Civil War era Missouri. Pretty amazing that this all took place today with no technical glitches at all and we were able to have a great conversation with an author 1,200 miles away! Why aren't classrooms doing more of this? Hello. Today's podcast is an update on my 365 Photo Project for 2010. I am taking a picture each day this year and posting it on Flickr. You can check out my photos so far this year below on the slideshow. Press PLAY button below to listen to podcast on this page. Hello. For the past couple of weeks I have been reading "The Monuments Men" by Robert M Edsel. This books tells the fascinating story of American troops racing across Europe to find and save the priceless art work taken by Hitler and the Nazi war machine. This podcast is my quick review of this novel and how it could be implemented into an interdisciplinary lesson in the classroom. Hello. I am a big fan of the American Experience series from PBS and WGBH. This series has produced some of the most fascinating and engaging historical documentaries I have ever seen. One episode that I have used repeatedly in my class over the years is "The Donner Party" by Ric Burns. This documentary is both haunting and descriptive in telling the tale of this group's fateful journey west. For the past several years I have had my students participate in a debate after finishing the video. The debate is centered on the role of Lansford Hastings - the person who told the Donner Party to take the shortcut that cost them valuable time on the attempt to reach California. The Donner Party becomes trapped in the mountains and some resort to cannibalism. The class is divided into two groups and debates whether the blame should be placed upon Hastings or the Donner Party themselves. While watching the film students have been recording events and information which could be used to defend both sides of the debate. Two years ago I started recording the debate in audio format. I then contacted several Donner Party experts - authors and writers who have experience with the Donner Party - and asked if they could critique the debate and provide feedback for my students. I sent the audio file as an attachment with the e-mail. This was very successful and my students loved the feedback. This year we used a Flip camera to record the debate in video format and I then posted it to YouTube. I contacted a variety of Donner Party experts through web searches and found five individuals who were willing to take the time to comment on the student debates. I then gathered the responses from all the experts and created a handout for my students. I am always amazed at the amount of detail these experts provide. The technology used in this project is pretty simple - posting a video on YouTube and then sending an e-mail but the ability to find experts in the field and then have them comment directly to students is extremely powerful. To learn more about this project please listen to the podcast. I have also included the links to the student debates and included one video as a portion of this blog post. I am also posting the feeback from the experts as a PDF if you would like to see the comments the experts returned to my class. If you have any comments on this project please feel free to leave a comment on this blog post. I recently learned that I've been selected to attend the 2010 Gilder Lehrman Summer Institute on George Washington at Mount Vernon this summer. I'm very excited for this opportunity. 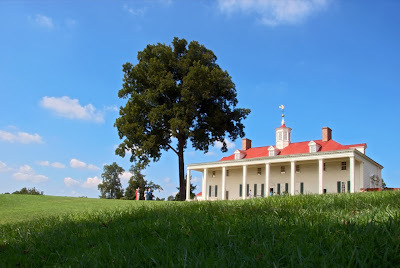 I visited Mount Vernon a couple of years ago with my wife and we spent the entire day in awe of this location. 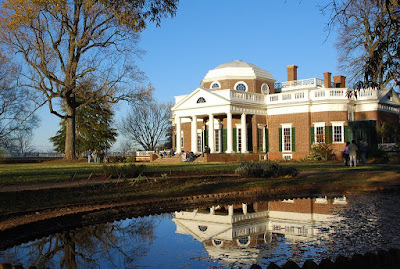 I'm looking forward to visiting and of course will be blogging as well as posting pictures and recording some podcasts from Mr. Washington's house. Attention history teachers : The History Channel is offering a FREE set of DVDs from their upcoming (April 2010) new series "AMERICA The Story of US". Each school in the country can request a free DVD set if their principal fills out the information on this site. This series will be amazing and I'm sure each school would benefit from having it in their collection. Video Trailer for "America The Story of Us"
Press Release on the Educational Connections to "America The Story of Us"
History Channel page for "America The Story of US"
The winner of "The Presidents" DVD set from PBS and the American Experience is CONNIE SITTERLEY of Spartansburg, Pennsylvania. Congratulations to Connie! Please e-mail me your address (or leave it as a comment to this blog, it will get to me and I will not post it) and I will be sending you the DVD set soon. My daughter drew Connie's name out of a hat. Thanks to all of the 28 people who left a comment on the president they would most like to meet over coffee and which question you would ask. I plan to do a podcast on the responses in the near future. I spent part of last week in St. Louis at the MCSS (Missouri Council for the Social Studies) Conference. Our conference was held at the Hyatt about a block away from The Arch. On Saturday morning I walked over at around 8:00 AM and took some great pictures. The clouds were just right and the winter sun was shining. 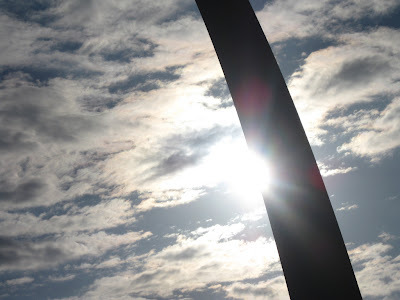 You can check out my Flickr set of The Arch here. Happy Birthday Abe! Abraham Lincoln was born 201 years ago. We're big fans of President Lincoln at our house - we have a huge framed Lincoln print in our hallway. Tonight we celebrated by singing Happy Birthday to Abe and then celebrating with cupcakes before the girls went off to bed. Yes, we are a family of History Geeks - that is how we roll in the Langhorst house. Hello. Today we're talking about presidents and giving away an amazing prize to one listener, courtesy of our friends at WGBH and the PBS series "American Experience". Since it is close to Presidents Day I thought we would discuss which president - living or deceased - you would most like to sit, enjoy a cup of coffee with and chat. It was a close call for me between Washington and Truman. To find out who and why listen to the podcast. I encourage you to leave a comment on this blog and tell us : 1) which president you would most like to meet for a cup of coffee and 2) what topic would you most like to bring up in conversation with the president. Please also include your name and where you live. I will collect all the names of those who commented telling us their choice between today and February 23, 2010. I will place all the names in a hat and have one of my daughters draw out a name. The name chosen will win "The Presidents" DVD set from American Experience. I will mail the winner the set. This 15 DVD set has biographies of Roosevelt, Wilson, FDR, Truman, Kennedy, LBJ, Nixon, Carter, Reagan, and Bush - over 35 hours of content. The set has a retail value of $130.00. Hello. I'm currently working on my doctorate degree in Teacher Leadership from Walden University. I have completed one year of the program to date and have two more before I'm finished. Last summer while attending a residency for my program in Minnesota I was asked to sit down and talk a little about my classroom and my experiences as a Walden student. Below is one of these videos. In this segment I discuss some of the ways that I have incorporated technology into the classroom. Are you an innovative teacher? Enter the 2010 PBS Innovation Awards. Check out the information below and enter before March 12, 2010. Show us how you inspire your students and you could win a behind-the-scenes trip to the Premier Annual PBS Event! America’s teachers innovate every day. From math and science to music and the arts, your inventive thinking continuously fuels, inspires and engages young minds. Whether you teach your students physics with rocket launchers, social studies by re-enacting historical events, or literature by inviting kids to create digital stories, you are innovating and making a difference – and we want to recognize and thank YOU! PBS and local public television stations invite you to enter the PBS Teachers Innovation Awards! 2. Tell us why you are an innovative educator in 200 words. 3. Submit a video clip or a photograph showing us how you inspire your students. Be sure to have the video or image ready before you click "Enter Now". Our panel of judges will select 50 PBS Teachers Innovators as winners. 1st PRIZE : The TEN most innovative teachers will win an EXCLUSIVE, behind-the-scenes trip to the PBS Annual Meeting in Austin, Texas on May 17-20 to see sneak previews of programs, meet producers and attend premiere events! 2nd PRIZE : FORTY teachers will win a bag chock full of PBS gifts! All Winners will receive a FREE Teacherline professional development course and will be invited to partner with PBS and local public television stations as leaders in classroom innovation. All Teachers who enter will be registered as members of the PBS Teachers online community and will receive a 10% discount to our online PBS Store. What is the deadline for entries? The PBS Teachers Innovation Awards runs January 25th through March 12th. Winners will be announced April 5, 2010 and winning entries will be featured on the PBS Teachers web site. PBS and local member stations thank you for your daily boundless energy and innovation! You inspire us to create high-quality programs and local services that we hope help make your work a little bit easier. Thank you! Hello. President Obama will be giving his first State of the Union on Wednesday, January 27th. 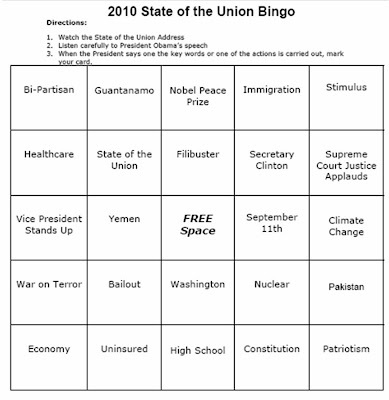 If you are looking for a great classroom activity for your students please check out the 2010 State of the Union Bingo lesson plan from the National Constitution Center in Philadelphia. This is a fun and engaging way to have your students watch the State of the Union. Check it out. Hello. It has been almost a month since my last podcast. Today I dive back into the podcasting pool with some reflections on a wide variety of topics. I start by discussing the start of my 365 Project in which I take a picture each day during the year and post it on Flickr. The next topic is the Barringer Research Fellowship - a great opportunity this summer for any teacher who wants to learn more about Jefferson at Monticello. If you have any comments please feel free to leave a comment on this blog entry. If you are spammer who just wants to leave a link with some totally generic comment, please move along. Thanks. This is part of my 2010 365 Project in which I take a picture each day during the year. I love having a smoething with me so that I can write down notes and ideas. 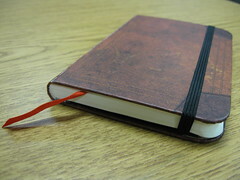 Last spring I found a great little journal that is the perfect size - about 3" x 5". I have since filled up several of them and my wife gave me two new ones for Christmas. They are made by PaperBlanks and I highly suggest them to anyone who loves to jot down notes and ideas. Photo taken with my camera. Today's picture is a shot of my home desk. 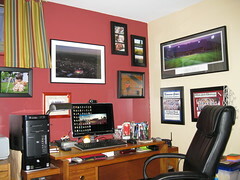 We remodeled our basement and this is where I work and create at home on the web - most of the time. This is also my podcast studio for most of my "Speaking of History" episodes. I enjoy my set up and have decorated it with all pictures of family, memories and the things I love. We are at home today for the third snow day in a row so I picture of snow or ice would have worked today as well but I'm getting tired of snow. We have also already canceled school for Friday as well so instead of a "snow day" it has truly been a "snow week". This afternoon it started to snow again and we had our second straight snow day from school in a row. This is our third snow day of the year so far after having none last year. They are predicting a couple more inches of snow tonight and then a wind chill of around 30 degrees below zero for tomorrow. It looks like we might not have school for the rest of the week. 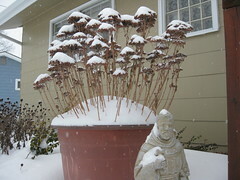 The picture today is from the front of our house as the snow falls this afternoon. Photo taken with my camera. Today we were supposed to start back with students after Christmas break but we have a snow day instead (roads are still not cleared from the last couple snowfalls and we have bitter cold). The rest of the week may actually be worse so we'll see how many days we get in this week. 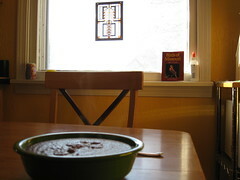 I chose today to take a picture of my snow day breakfast - a piping hot bowl of chocolate Malt-O-Meal - the good kind made on the stovetop with milk. It takes a little longer than the microwave version but it's worth it. We have a birdfeeder that sits at at window level just outside of our kitchen. (You just can't see it in the picture because of the glare off the window.) We love sitting at breakfast and watching the Cardinals, Blue Jays and various woodpeckers. With the forecast for the next couple of days we'll need to be sure to keep it filled for our friends. The past couple of years I have wanted to start a 365 photo project but for various reasons never started. This year I decided I should take on this project. Each day during 2010 I will be taking a picture of something during the day and adding it to my collection. Some days it might be a scenic shot (as my first photo is) or it might just be something on my desk or a view outside my window. I will be posting each of these images to my 365 Flickr photo set. I like the Flickr option for collecting my 365 photos because I can also add notes to parts of the photo which anyone can view by mousing over that portion of the photo and people can also leave comments directly to the photo. I also plan to create a photo book at the end of the year using all the images and having them on Flickr and using Lulu will make this a snap. I love taking pictures and think this project will be a lot of fun. Most of the photos will probably be taken with my camera - a Canon PowerShot A1000 which I really enjoy. Some of the photos will also be taken with my BlackBerry, which I think takes pretty good shots for a phone. If you are attempting a 365 project, or just want to comment on mine, please leave a comment on this blog. Thanks. My first photo of the 2010 365 project. This photo was taken with my camera on the drive down to Cheyenne from Torrington in Wyoming. 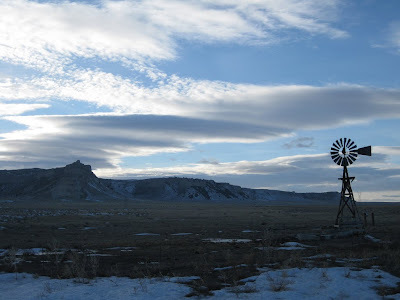 I loved the way the windmill set up the picture with the clouds and the snow on the ground. If you look behind the windmill you can see a powerline in the distance - sort of a cool "past and future of power on the Plains" message. Photo taken with my camera. Dr. Eric Langhorst teaches 8th grade American History, broadcasting and technology at Discovery Middle School in Liberty, Missouri. He is a 2012 Google Certified Teacher, 2008 Missouri Teacher of the Year, 2015 Mount Vernon Life Guard Teacher Fellow and 2015 Swivl Pioneer. He works with teachers and school districts to effectively incorporate technology in the learning and presents at workshops and conferences.